A few years ago I saw Swedish musician Daniel Norgren for the first time and was immediately sold. Normally I'm not really into this country-like singer/songwriter music but there's something different about the Swede. He proved it again last month when I saw him in a festival tent full of chatting people where he managed to play a wonderful set as if I was the only one there. He played some songs of his newest album Alabursy as well. That record struck me right away with its gorgeous compositions, the wonderful voice of Norgren and the atmosphere the songs create. It's one of those albums that simply wants you to stop everything you're doing and just sit down and listen with your eyes closed. Intimate songs like 'Everything You Know Melts Away Like Snow' and 'Like There Was A Door' are so beautiful they make you forget about the world around you. It's as if the music takes you out of your surroundings and puts you into the Swedish woods in front of a cabin with nothing else to distract you. "I hear the old folks when they say it's funny how time slips away/I hear the old folks when they say the day's getting shorter every day"
"May I let the puppy sleep here in my bed? Puppies got bugs that lay eggs inside your head"
Norgren unmistakeably has a unique talent of writing lyrics and music, the ability to create somewhat mysterious songs that grab you by your throat and don't let go any more. I don't think I will hear many better albums this year. 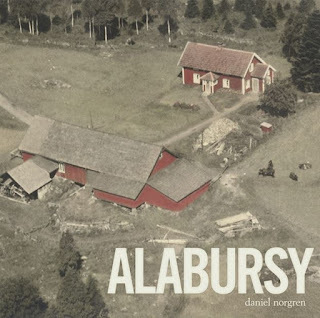 If you haven't heard of Daniel Norgren yet I suggest to look him up. Sit down, close your eyes, forget about the world and simply listen. Listen to 'Alabursy' on Spotify.